Preparation: Bring a doll wrapped in swaddling clothes to represent Jesus. Today is the fourth Sunday in Advent. Christmas is very near. In the middle of all the busyness and decorations and excitement about presents, are you remembering who we are getting ready for? What is Christmas all about? (Let children respond.) That’s right, we’re waiting for the baby Jesus. This is not an ordinary baby; this is the Son of God. When this baby comes, incredible things will happen. You wouldn’t normally think of a baby as a dangerous weapon, would you? Babies are helpless and soft and sweet. What could a little baby do? But baby Jesus was no ordinary baby. In sending Jesus to earth, God did the impossible. Is it possible for the power of God to be contained within a tiny infant? It happened. Could God love us so much that he would send his only son to save us from our sins? It happened. Could God, as a human, take on all the powers of the devil and sin and destroy that power with love? It happened. With God, nothing is impossible. When the angel Gabriel appeared to Mary and told her that she was going to give birth to God’s Son, it was hard for Mary to believe. The angel told Mary, “Nothing is impossible with God” (Luke 1:37 nlt). A wonderful song by an English composer named Benjamin Britten describes Baby Jesus as a weapon who came to destroy evil. Britten’s song tells how tiny Jesus—just a few days old and shivering in the cold—made the Devil and all the powers of hell shake with fear. Without any weapons or armor, Jesus surprised “the gates of hell” and defeated Satan. A tiny baby can change the whole world. The power of evil is destroyed by a tiny baby. The baby Jesus comes this Christmas to save us all. The baby Jesus is the Son of God; and with God, nothing is impossible. 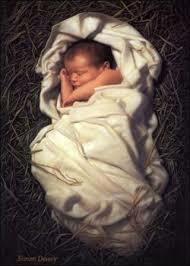 Prayer: Praise to you, Lord God, for sending your only son, Jesus, to our earth as a little baby. Thank you for sending Jesus to save us from our sins and to bring us eternal life!